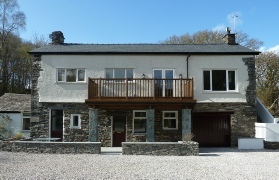 LINGMELL is a well-appointed double-glazed house with 3 bedrooms, 2 living rooms and 2 kitchens, accommodating 7 people, and is converted from part of the outbuildings of a country house set in a wooded estate of 6 acres (Lake Bank) at the south end of Coniston Water (see maps below). Lake Bank pier is 2 minutes walk away. Effectively, Lingmell is comprised of two self-contained apartments that are linked together. Two separate entrances along with two kitchens and two sitting rooms make this ideal accommodation for two couples or for a family who wish to have a little space for themselves. Click on the left for more details, pictures and booking information. Lingmell is ideal for walkers. You can walk out of the house straight onto the Blawith Fells which include Beacon Fell. There are glorious views of Coniston Water and the Coniston Fells and you can even see Fairfield and Helvellyn from the grounds. Pets, especially dogs (up to 4), are very welcome at no extra charge. The owner has a dog! Lingmell is a good base for cyclists, being in a quiet corner of the Lake District National Park. There are excellent quiet bike rides nearby, for example on the eastern side of Coniston Water and Grizedale Forest. Bikes can be left in the garage or logshed. It is comprised of two self-contained apartments that are linked together. The house and garden are child-friendly. Lingmell is on a quiet 6 acre wooded estate which is good for exploring and playing games. Indoors, there are books, maps, walking guide books, board games, 2 TVs, & DVD players, a video player with a large collection of videos, and hi-fi. Also ideal for boating - see below.